The initial lineup has been revealed for the 2015 Rock And Shock Festival. 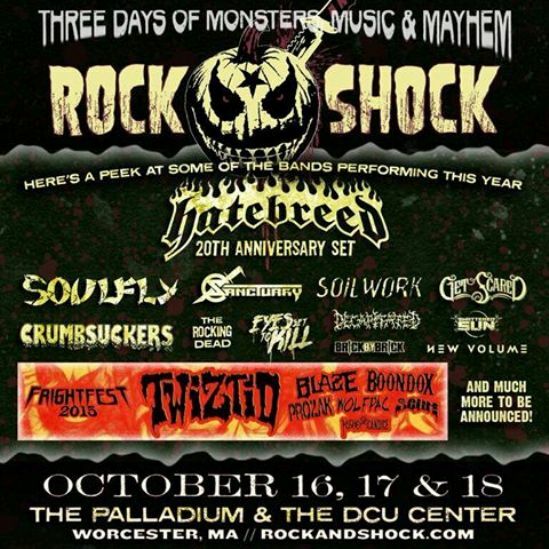 The festival will take place October 16-18, at The Palladium & The DCU Center in Worcester, MA, and will include: Hatebreed (20th anniversary set), Soulfly, Sanctuary, Soilwork, Crumbsuckers, The Rocking Dead, Get Scared, Eyes Set To Kill, Decapitated, Shattered Sun, Brick By Brick, New Volume, Twiztid, Blaze, boondox, Prozak, Wolfpac, Scum, and Kissing Candice. This entry was posted in News, Rock And Shock and tagged Blaze, boondox, Brick By Brick, Crumbsuckers, Decapitated, Eyes Set to Kill, festival, Get Scared, Hatebreed, Kissing Candice, lineup, Metal, New Volume, Prozak, rap, Rock, Rock And Shock Fest, Sanctuary, Scum, Shattered Sun, Soilwork, Soulfly, The Rocking Dead, Twiztid, Wolfpac. Bookmark the permalink.